It seems to me there are two ways of thinking about things. Baseball, as you know, is the one major sport where the playing dimensions between venues can be wildly different. Given that, I think you can either prefer neutrality and standardization, or you can choose to embrace the differences. There are limits to the latter — I don’t think anyone wants to see a stadium that makes a mockery of the contest, because you don’t have reasonable competition. But we haven’t gotten to the mockery point. So, personally, I like the quirks, even if they seem occasionally unfair. Focus on that unfairness for a moment. If something were simply too unfair, it wouldn’t work. Fans wouldn’t support it. You couldn’t play a real baseball game with fences right behind the infield because the product wouldn’t be recognizable. I think there are certain features, currently, that approach the threshold without crossing it. Like, left field in Minute Maid Park approaches the line, because it yields a number of pretty weak home runs. It’s true, but without being out of control. On the opposite side of things, there’s straightaway center field in Minute Maid Park. If you want to conquer that, as a hitter, you have to hit the most difficult homer in baseball. You might remember the Houston Astros announced some planned renovations. You might also remember the renovations have been delayed because the Astros themselves didn’t expect to make the playoffs. When people talked about the renovations online, they’ve focused on two things: removal of the flag pole and removal of Tal’s Hill. Those are worth talking about because they’re two of the most unusual features in any stadium around the league. Something that’s gotten a little lost, though, is the fence will be coming in as the hill goes away. In time, the center-field fence in Houston will be 409 feet away from home plate. For at least one more season, the distance will remain 436. Four hundred feet, and another 36 feet. Longer home runs than this get hit, but it’s uncommon, even up the middle. This hasn’t turned people off, because this is just a small part of the Minute Maid outfield. It’s a part that also has a hill and a flag pole, and besides, center field is counteracted by left field. But that is a hell of a distance. 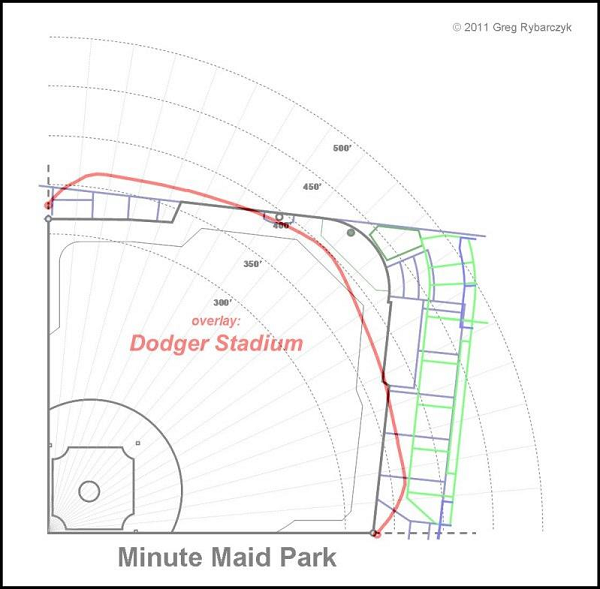 Let’s play with an overlay, from the ESPN Home Run Tracker. What’s a pretty normal stadium? I think Dodger Stadium seems pretty normal. Here’s Dodger Stadium and Minute Maid Park. I selected the range from 85 degrees to 90 degrees. That basically captures the whole center field feature in Houston. I did this for all of the majors, calculating how many homers have been hit in the different home stadiums. I combined the numbers for teams who have had multiple home stadiums in the past decade. This table tells you what you probably could’ve guessed. Cincinnati has averaged about 13 of these homers a year. Baltimore has averaged about 12. The average park is around eight. Detroit is between two and three. 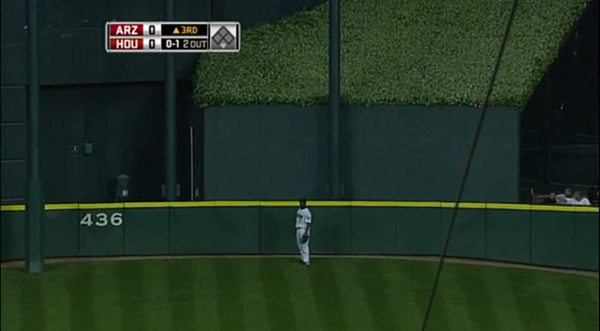 Comerica Park also has a notoriously deep center field. Houston yields just six results, total. Almost one every two years. This is a difficult home run. It’s not an impossible home run, but it’s almost as close as it gets with things how they are. That’s good. That’s a big home run. According to the data, it’s the longest of the six. But Upton hit my favorite. Because Upton found the deepest part of the deepest part, as if simply to prove his capability. He didn’t need to hit the most difficult possible homer. He chose to, and it turned out to be the only run of the game. Michael Bourn thought Justin Upton had some nerve. Upton made Bourn run as fast as he could for 100 feet. Upton made Bourn run straight up a hill. Upton made Bourn run for nothing. And then Bourn had to return to his position. I assume that caused an extended delay. The hardest home run to hit has been attempted in Houston, and it’s happened once in the last five years. A home run to center in Minute Maid Park isn’t worth extra runs on the scoreboard, but it’s worth a little extra something at home or in the stands, which is kind of the whole point. Alas, before long, there will presumably be a different hardest home run, as this could be the final year of opportunities. There will always be homers to center in Houston, but it won’t matter as much when the fence is brought closer. Keep an eye out. Maybe two, when George Springer is up. A ballpark quirk is approaching the end of its life, and though there’s no shortage of ballpark quirks, there will soon be a shortage of this one. It’ll be missed… sometimes. We hoped you liked reading The Most Difficult Homer In Baseball by Jeff Sullivan! This is false. People think of home runs being longer that are pulled, but that is because they go further past the outfield wall. 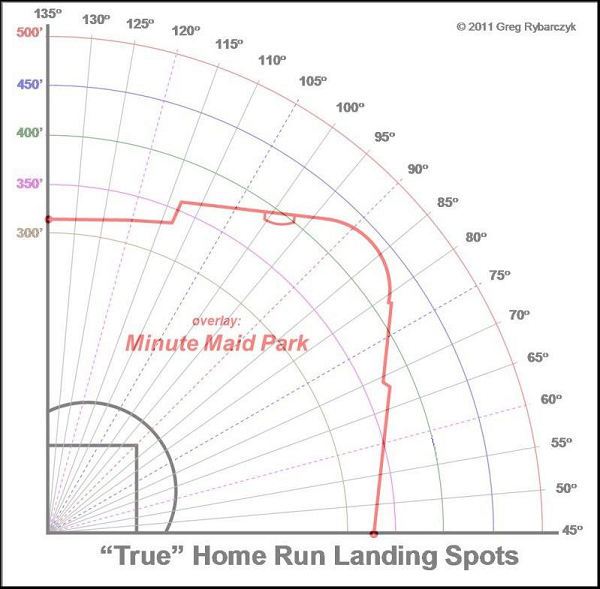 However, if you’re just splitting the field into thirds, the majority of long home runs are hit to center field. Data please. I happen to think that most pulled homeruns go the furthest, not just because it looks like it, but they actually do. I went and eyeballed it looking at the longest home runs of 2015 on home run tracker. 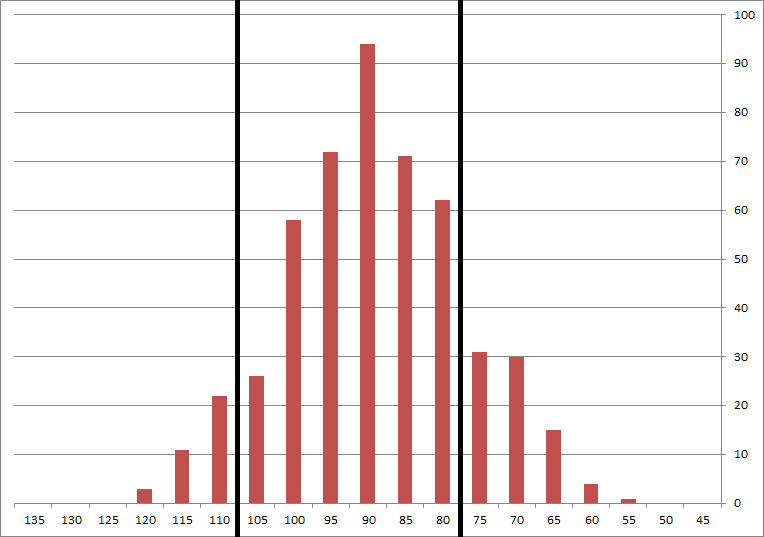 The majority have horizontal angles between 80 and 100, which is the middle. I don’t know how to export the data to excel, but if someone does, I’d be happy to be proven wrong. Well, I wouldn’t be happy, but I would accept it. I very much doubt that I would. I checked and, you’re correct! How about that! Thank you. I wanted to have an actual data point, but home run tracker doesn’t let you export data to excel like the great fangraphs does. You can always just copy and paste into Excel, but it’s not a lot of fun. I don’t recommend it. I makes sense when you think about it. The most efficient transfer of energy to the baseball should be when you send it directly back the way it came. This is also why straightaway CF has always been the deepest part of the vast majority of ballparks. That was what I was thinking. CF is always the deepest for a reason. I think the CF as deepest is an indirect result of most land parcels being square or at least rectangular. If you are fitting a baseball field in a square plot of land, it makes sense to put home plate in one corner, which makes CF the opposite corner, and therefore further away than the LF or RF corners. That is an interesting theory. And it could be the case that while minor league stadiums and some others that are not in tight confines of a city don’t have to conform to this, since it became the norm they do anyway. 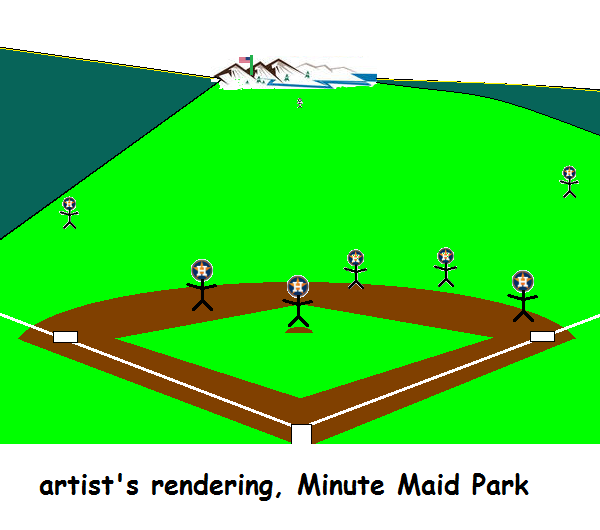 However, the point about physics is true, so it also makes sense practically for center field to be further out there.